Once upon a time there was a land filled with dolphins and chicken wings on a planet called Blob. On this planet, the weather was quite unpredictable, as on really windy days chicken wings would blow across the planet, hitting buildings and anyone unfortunate enough to be in their path. The aliens who lived on this planet spoke to their leader because they wanted to do something about the crazy weather and the terrible cheese monster, named Pain. Both were threatening their home, The Hidden Leaf Village. The leader of The Hidden Leaf Village was an alien named Cupcake Green Queen. Cupcake Green Queen loved to dance! Whenever she won a battle or an argument, she’d do the electric shuffle. 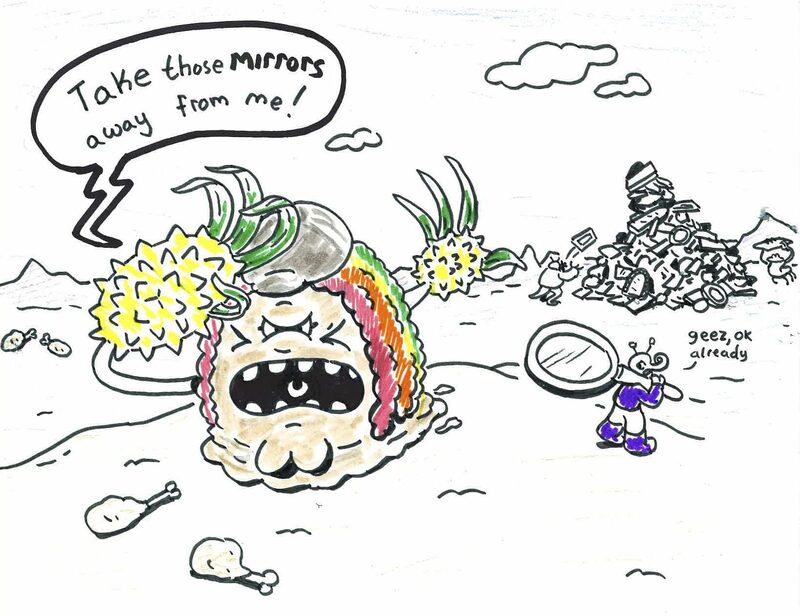 She had a blob body, rainbow dreads, pineapple arms, three eyes with a big one in the middle of her face, and could split apart into a million little Cupcake Green Queens at will. However, Cupcake Green Queen had a secret: she feared herself! Without saying why, she made every alien in the village throw out all their mirrors into space, because she got scared every time she looked into a mirror and saw herself. She also had another secret! Pain the cheese monster was her brother, and he controlled the bad weather on Planet Blob. She knew she had to defeat him, but naturally felt conflicted about it, because Pain was brother. But what had happened between them all those years ago…? Well, Cupcake Green Queen had kicked Pain out of the Hidden Leaf Village because he was being mean to the other aliens. He was jealous of Cupcake Green Queen because he wanted to be the ruler of the Hidden Leaf Village, which is why he was so mean to everyone (he had trouble working out his issues and took it out on others). The last straw for Cupcake Green Queen was when Pain set her mattress on fire in a fit of jealousy. She’d had it! He had to leave the village, and he was banished to the Nacho Cheese Volcano located on the Snobby Shores of the Candy Ocean. Pain left the village in a rage, and in his emotional state, he turned into cheese out of pure envy!